K 2013, Düsseldorf, 16 to 23.10.2013: motan presents the theme of “Service” as the focus of its presence at the K 2013 fair in Hall 9, Stand B 24. Questions concerning peripheral equipment technology will be discussed in the “mo’s corner” lounge area. The visitor determines the subject. 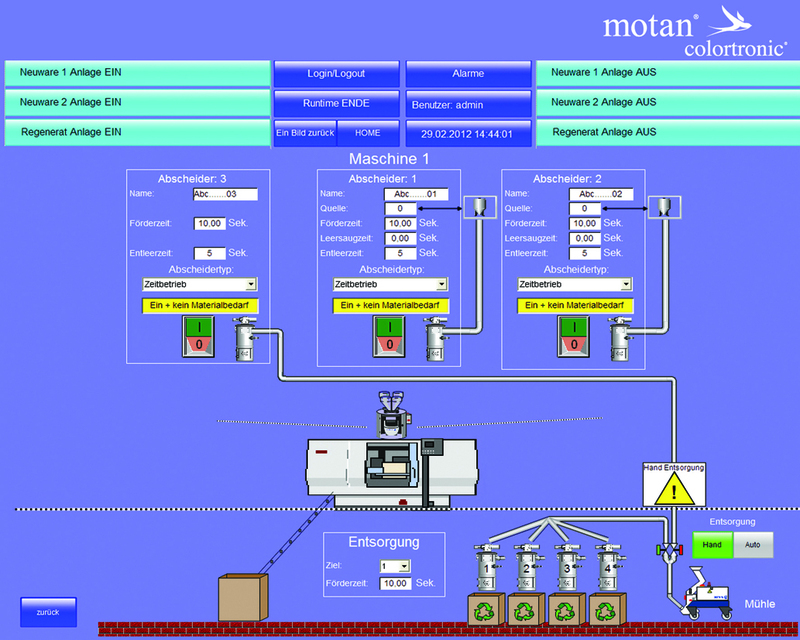 The selection of exhibits has also been tailored to specific application requirements reflecting motan’s commitment to comprehen sive understanding of processes in order to offer product and system solutions to users with customer applications in mind – e.g. in medical technology, in the pharmaceutical area, extrusion, injection moulding and blow moulding, etc. The new range of small compressed air dryers with hopper volumes of 0.75 / 1.5 / 3 and 5 litres counts as one of the highlights among the exhibits. Medical technology demands compliance with stringent requirements and standards – conformity with FDA regulations, GMP and many others. It is therefore not surprising that this requires cleanroom quality, especially when considering plastic products, i.e. medical devices that are used on or inside humans. The requirements to which plastics processing machines are submitted are correspondingly tight – and not least also for the materials management equipment. 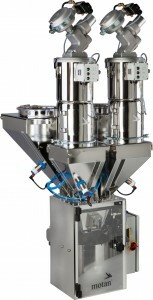 The ULTRABLEND gravimetric batch dosing and mixing equipment is ideal for applications placing high demands in terms of freedom from contamination, mixing precision and repeatability. Due to its IntelliBlend technology, this silicone-free system offers high dosing precision and dosing consistency. The system is additionally equipped with filterless conveying. motan attached high value in its design of container components in electropolished stainless steel for clear functions in a hygienically clean working environment. The LUXOR CA S range with hopper volumes of 0.75 / 1.5 / 3 and 5 litres has been conceived especially for the production of small and micro parts. On account of their light and compact construction, the dryers can be simply mounted on all processing machines, also when space is highly restricted. The LUXOR CA S compressed air dryers take factory supplied compressed air which is expanded to atmospheric pressure. This produces dry process air with a very low dew point which is then heated to the required drying temperature. No desiccant is required. All models are equipped with a thermostat and low air flow safety switch to prevent overheating of the material in the event of insufficient air throughput. 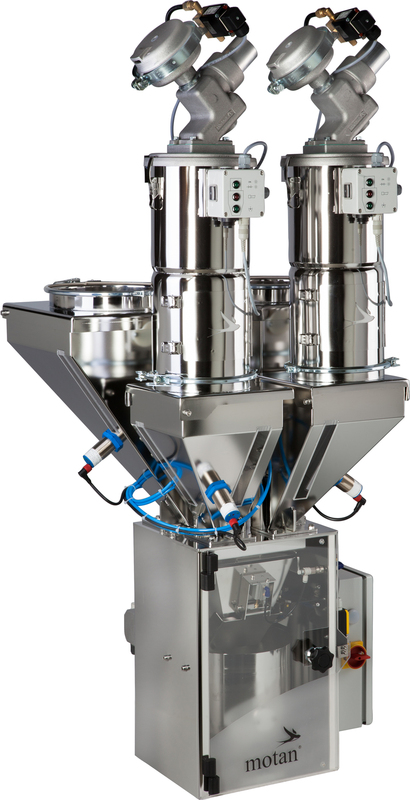 With the new gravimetric (loss-in-weight principle) collecting bin, demanding flood-fed processes (using single-screw and counter-rotating twin-screw extruders) can now be connected to the SPECTROCOLOR G dosing and mixing station. The main application is in production of yarn fibres, as here the material level above the extruder has to be kept as low as possible in order to prevent material de-mixing in the collection bin. The new HT high temperature version has been designed for material input temperatures of max. 180°C or 355°F. High temperature applications such as production of high temperature fibres in PA and PET/PBT are therefore also possible. Recipe precision and consistency are key factors in product quality and therefore also for profitability. Highest mix consistency is achieved with the motan gravity mixing principle. Reliable material filling of the weigh bin is guaranteed by a material loader with a pneumatic discharge flap or via a double slide valve with supply hoppers. This thereby completely covers the entire extrusion processing spectrum (production of pipes, hoses, profiles, as well as blown and cast film, sheets, fibres and tapes), but also compounding. Up to six components, each with a throughput range of 0.2 to 1.200 kg/h per dosing axis can be synchronously and gravimetrically dosed and mixed with the SPECTROCOLOR G dosing and mixing station. The GRAVInet GP control system has been joined by a smaller high performance brother, GRAVInet GP light. GRAVInet GP light is therefore a compact control system for up to two dosing modules. It has been entirely designed in a modular way – the logic and all interfaces including the HMI (human machine interface), etc. The well-known operator interface has been retained, but equipped now in the GRAVInet GP light with a new WEBpanel with a 12.1″ TFT touch-screen. Connection to the GRAVInet GP light takes place via Ethernet. GRAVInet GP light is therefore a full-value member of the motan CONTROLnet control system family. motan has set itself the task, which it has also solved, to completely visualise the material handling process. The authorised line operator follows all functions in real time. He sifts through material protocols from the main menu and can apply changes in system settings. All data relevant to the product is documented in real time, recorded and archived. A further screen page shows operation reports and alarms, complete with selection and print-out functions. A number of configurable user and access levels provide protection from unauthorised access. Individual compilation of the control system is based on the requirements of the customer and the application. This enables handling, focused on specific target groups, that has the highest possible level of efficiency and operational security. With immediate effect, the ATTN automatic temperature and dew point levelling system option is now available for the entire LUXOR A dryer range. ATTN has been specially developed for applications with which drying of materials may only take place within a narrow dew point “window”. The dew point of the process air is constantly regulated and documented to ensure regulation precision within +/- one degree. Connection to the well-known ETA plus® technology is sensible here, as regulation of the amount of air is then optimally supported with constant dew point. Important: the risk of over-drying plastic granulate at too low dew point is reduced by using ATTN. The METROLINK material selection system has its own autonomous control system based on the well known motan METROnet MK control system and it can therefore be used independently for remote controlled and automatic material supply. METROLINK is compatible with all system conveyor equipment and can be networked with all other network control systems. The operator now has a full-graphic 5.7″ colour touch-panel in his view. A maximum of 15 processing machines with up to 16 different materials can be fed per METROLINK tower. Several towers can be operated together. The user can be assured of advantages such as simultaneous conveying of a number of different materials, automatic switching in of the material route and secure material change free of material inter-contamination through use of automatic process management.